Art project. If these two words conjure up visions of five-year-olds constructing wondrous things from coloured paper and glitter glue, spare a thought for Noah Birch, site manager for Sculpture by the Sea, a bi-annual waterfront exhibition held in Perth’s Cottesloe in March and Sydney’s Bondi in November. Structure isn’t the only thing Birch nudges along. After the submission is accepted, he is responsible for ensuring the sculptor delivers the work on time, much like a program manager overseeing individual art projects. The importance of placement should not be underestimated. 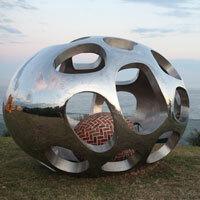 Sculpture by the Sea is foremost an exhibition, which means all works are for sale. Viewing the work in a particular context therefore has affects its saleability. Birch liaises with the sculptors to acquire an understanding of the visual experience they want. “Some works you really need to access 360 degrees. Other works have a front and it’s okay to put them up against the brush. It might not always come through on the application, so it’s really important to have this conversation about how they feel their work would be best viewed,” he explains. Image above: ‘seas nest’ by Zhang Yangen (Sculpture by the Sea Bondi 2012). Photo by Howard Jones, courtesy Sculpture by the Sea.